Peptide CFLQPDINIGKQE, corresponding to amino acid residues 125-137 of rat Parathyroid Hormone 2 Receptor (Accession P70555). Extracellular, N-terminus. Homology Mouse - identical; human - 11/13 amino acid residues identical. Standard quality control of each lot Western blot analysis (unlabeled antibody,#APR-052), and immunohistochemistry (labeled antibody). Bisello, A. et al. (2004) Mol. Endocrinol. 18, 1486. Usdin, T.B. et al. (1995) J. Biol. Chem. 270, 15455. Gensure, R.C. et al. (2005) Biochem. Biophys. Res. Commun. 328, 666. Hoare, S.R. et al. (1999) Endocrinology 140, 4419. Usdin, T.B. et al. 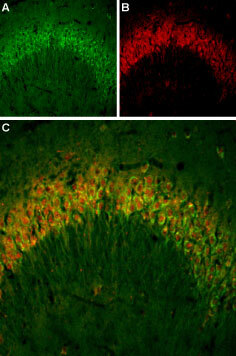 (2002) Receptors Channels 8, 211. PTH (parathyroid hormone) regulates Ca2+ and phosphate homeostasis through its action on specific receptors in kidney and bone. There are two known PTH receptors in humans, PTH receptor type 1 (PTH1 receptor) and PTH receptor type 2 (PTH2 receptor)1. The PTH2 receptor is a member of a class B subfamily of G-protein-coupled receptors that includes the receptors for the glucagon-GHRH-VIP family of peptides (glucagon, GLP-I, GIP, GHRH, VIP, secretin, PACAP) and for calcitonin and CRF2. PTH2 receptor shares the same basic structure of the GPCR superfamily of proteins. A defining feature of the family B receptors is the relatively long extracellular N-terminal domain, which comprises about 150 amino acids and is important for ligand binding. The seven transmembrane domains are believed to be arranged in a circular or oval configuration, as seen in rhodopsin. The transmembrane domains are connected by three extracellular and three intracellular loops, and a C-terminal tail of about 130 amino acids extends intracellularly3. Northern blots of human messenger RNA (mRNA) show that the PTH2 receptor is most highly expressed in the central nervous system, preferentially in the hypothalamic regions and is also detected in the pancreas, testis, placenta, and lung4. Recent data support that PTH2 receptor is involved in hypothalamic releasing-factor secretion and pain5. Anti-Parathyroid Hormone 2 Receptor (extracellular) Antibody (#APR-052) is a highly specific antibody directed against an extracellular epitope of the rat protein. The antibody can be used in western blot analysis. It has been designed to recognize PTH2 receptor from human, rat and mouse samples. Anti-Parathyroid Hormone 2 Receptor (extracellular)-ATTO-488 Antibody (#APR-052-AG) is directly labeled with an ATTO-488 fluorescent dye. ATTO dyes are characterized by strong absorption (high extinction coefficient), high fluorescence quantum yield, and high photo-stability. The ATTO-488 label is analogous to the well known dye fluorescein isothiocyanate (FITC) and can be used with filters typically used to detect FITC. Anti-Parathyroid Hormone 2 Receptor (extracellular)-ATTO-488 Antibody has been tested in immunohistochemistry applications and is especially suited for experiments requiring simultaneous labeling of different markers. Anti-Parathyroid Hormone 2 Receptor (extracellular) Antibody (#APR-052), (for western blot analysis).